Rodney McAree says Coleraine need to pick themselves up ‘as quickly as possible’ after their long unbeaten run came to an end. League leaders Glenavonput the Bannsiders to the sword at The Showgrounds last Saturday inflicting the hosts first domestic home defeat since April 2017! 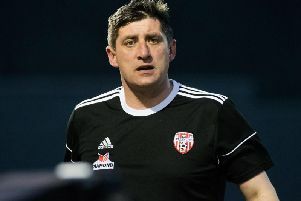 McAree, who took over the Irish Cup holders following Oran Kearney’s departure to St Mirren in September,says his team have to draw a line under it now and move on. “I said to the players that they had to be congratulated for their long, unbeaten run,” he said. “Now that’s off our back, we have to pick ourselves up as quickly as possible. “Our next game is in the Irn-Bru Cup and it gives us a chance to get away as a group and spend a little bit of time together and focus on another tournament. “We have to make sure that we are ready to go when we get back to the Premiership. “It’s a start of a new era for me because you have to pick the players up and the players within the team need to realise that it’s about working hard collectively. Coleraine take a break from domestic fixtures this weekend as they travel to Wales to face Connah’s Quay Nomads in the Irn Bru Cup. McAree is hoping the break away can help kick start the Bannsiders season. “It’s certainly a game that you won’t make wholesale changes as you want to pick things up as quickly as possible and play a strong team,” he said. “I’ve watched a couple of their videos and they are big, physical strong. After an impressive season last time out with the Bannsiders finishing runners up in the league, McAree says it is time to move on and get this term back on track. “It’s important that we forget last season and to be honest our performances haven’t been good all season,” he said. “There have been too many so-so performances and we need to realise where we are. We need to understand that we need to up our performances by a significant amount if we are to do anything. “I think certain individuals can do more and there is a little bit of feeling sorry for ourselves throughout the team. Saturday night’s game against Connah’s Quay Nomads will certainly be a tough test for the Bannsiders. Andy Morrison’s side surged to the top of the JD Welsh Premier table after nine games following their 3-1 win over Cardiff Met last Sunday afternoon. “It was a terrific win,” said Morrison. “We are in a good space at the moment, we are playing really well, we’re being brave with our formations, we are asking questions and we are stopping teams playing against us. Coleraine’s Irn Bru Cup game with Connah’s Quay kicks off this Saturday night at 7.30pm. Live coverage is available on S4C.